On Saturday January 29th and Sunday, January 30th, Trauma Specialists from The Montreal Children’s Hospital cheered on various atom-level hockey teams as they participated in the National Atom Hockey Tournament in Verdun. More importantly, however, they were spreading awareness about concussions in sports by talking to players, parents and coaches, and focused on preventing the incidence of mild traumatic brain injuries in hockey. For more information about concussions, click here to consult our Concussion Kit. The National Atom Hockey Tournament ran from January 24th to February 6th and brought together 62 teams from Québec, Ontario and the United States. 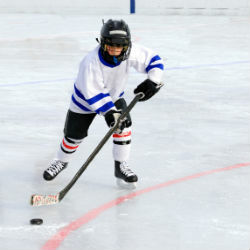 Over 127 hockey games were played over 14 days of competition.